Village Point Townhomes in Breckenridge Colorado real estate are within walking distance to town and the Breckenridge Ski Resort ski slopes. These Breckenridge townhomes are located in the Warriors Mark subdivision on the south end of Main Street Breckenridge. 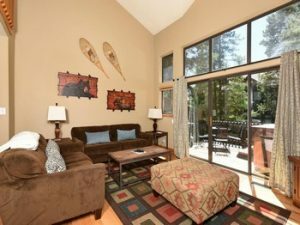 Village Point Townhomes offer larger floorplans in an incredible location with nearby hiking and biking trails and boasts a peaceful setting with lodgepole pines, blue spruce evergreens and aspen trees surrounding the multi-family residences. The Village Point Townhomes consist of 51 privately owned residences ranging from one-bedrooms up to large four-bedroom + den units. All of these Breckenridge townhomes have private decks and most are outfitted with private hot tubs. These multi-level units offer a separation of space for families, many of the properties also have large, individual garages with enough space for storage and one large vehicle. Sidewalks within the complex are conveniently heated for the winter weather. In addition to being within walking distance to the base of Peak 9 at the Breckenridge Ski Resort, the Village Point Townhomes entrance is also located less than 100 feet from the Breckenridge FreeRide bus stop – taking you throughout the Town of Breckenridge at no cost. Outside of being one of the most popular ski resorts in North America, Breckenridge offers a real town with year-round residents, lively nightlife, shopping, restaurants and a rich historical culture. To discuss your Breckenridge CO Real Estate search, inquire about a specific property or for local market data contact Justin and Krystal Knott with LIV Sotheby’s International Realty at 970.333.9050.